Getting ready to go on stage is exciting for Treble Choir singers. In February of 2018 the Treble Choir had the unique opportunity to make a movie! A short film by Kyle Misak, The Acorn is a beautiful love story shot in Three Oaks, Michigan. The Kalamazoo Children’s Chorus was proud to participate in this exciting project. We hope you will enjoy watching it here, as much as we enjoyed making it. The Treble Choir continues the work begun in the Preparatory Choir. Under director Darlene Sang, this choir enjoys working on two part singing, score study, musical terminology and general musicianship. This choir performs at the Holiday Concert and the Spring Concert at Chenery Auditorium. Every two years, the Treble Choir sings in the Nutcracker Ballet with the Kalamazoo Symphony Orchestra and the Ballet Arts Ensemble which took place on the weekend of December 8, 2017. 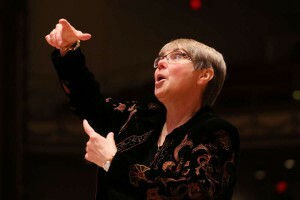 Darlene Sang, Treble Choir Director. 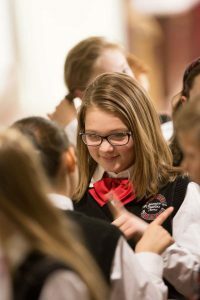 At the end of the season, choristers can chose to remain in the Treble Choir or audition to move to the next level, which is the Concert Choir. The Kalamazoo Children’s Chorus thanks to First National Bank of Michigan, Treble Choir Underwriter for the 2017-2018 season. Tuition for the Treble Choir will be $475 for the upcoming 2019-20 season. Your child’s place is held with a $50 non-refundable deposit that is applied directly to your tuition. Tuition for siblings is discounted. There are no additional audition or registration fees. New member auditions for the 2018-2019 Bella Voce Choir were held on April 28 and May 5, 2018. But it’s not too late to join! To set up an audition appointment, email KCC Artistic Director, Fred Sang at fred@kalamazoochildrenschorus.org. 2017-2018 Treble Choir performs at Chenery Auditorium.